Neelyann Sheucraft and daughter Lowell Ann were rescued from floodwaters that burst into their home. (CNN) -- More than 30 people have died in historic flooding in the Southeast. Neelyann Sheucraft and her 4-year-old daughter barely escaped being among them. On Saturday, Sheucraft, a college teacher, was sitting on the couch in her Nashville, Tennessee, home, grading papers. The rain was hitting her windows so loudly, she briefly looked up. "Wow, that's pretty fierce," she thought and went back to grading. A few minutes later, Sheucraft heard water lapping against her house. She told her daughter, Lowell Ann, to stay put and jumped up to look outside. Her Nissan Altima was halfway underwater. She called her parents. "'Oh, my God, this is it. My house is going to flood," she said. "A few minutes later, the water came gushing in -- through the vents or any openings there were, I'm not sure where it was all coming in from. But the water was rising and rising and rising." Sheucraft called 911. The operator told her to get to the highest point in the one-story house. That meant climbing on the kitchen counter. The 38-year-old mother's adrenaline was pumping. She picked up her daughter, their two small dogs and Lowell Ann's favorite baby dolls and sat them on the kitchen counter. She then went for the attic door, trying to yank it open. "I told Lowell Ann to be good and not to move, to hold the dogs and her dolls tight," she recalled. "She said to me after some time passed, 'Mommy, 911 is going real slow.' "
Sheucraft pried open the attic door and grabbed her daughter, the dogs, the dolls and her cell phone. She began dialing as many people as she could. She talked to her parents, who were frantically trying to call anyone they knew who could help get their daughter out. On a hill above Sheucraft's low-lying dead-end street, neighbors were trying to work in the downpour. "We started getting canoes out of our garages, and some of us had Jon Boats," Brian Mitchell said. "We knew that when rescue workers got there, they would need help. The current, it was so strong. It was going to take a lot of people working together." Word that Sheucraft and her daughter were trapped reached longtime friend John Morse, a swimming coach. She said he drove to the neighborhood, parked his truck where the water was relatively low and, risking his life, dived in. When Morse reached the house, he shouted for Sheucraft and helped her out of the attic, she said. They grabbed a floating ottoman and told Lowell Ann to lie down on it. The little girl clutched a duffel bag, with the dogs peeking out. "I told her, 'This is going to be really scary, and it will be like nothing you've seen before, but Mommy is going to be right beside you. It's going to be OK,' " Sheucraft said. They got out of the house, and the current hit them hard. "It was stronger than any ocean," Sheucraft said. "I didn't think I could make it very long." 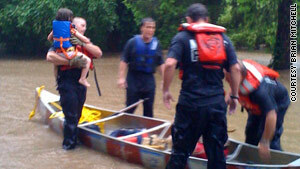 Mitchell and the neighbors were readying the canoes and setting out with rescue workers. When everyone spotted the floating ottoman, rescue workers tied it off to the only thing not underwater and pulled everyone to safety. It was a happy ending, despite the destruction of a home and thousands in repair bills. Many others in the area have not been as fortunate. As more rain is predicted for hardest-hit Nashville, authorities said that 21 people have died in Tennessee, six in Mississippi and four in Kentucky. On Sunday, a woman in Linden, Tennessee, watched her husband and daughter drown. Bobby Qualls had saved his son from the rushing water in their backyard, but when he went back to try to save his daughter, Kylie, they were both swept away. "From his neck up, he was staring at me. He didn't say anything, just staring at me," Sherry Qualls told CNN affiliate WSMV. "She was screaming for her daddy to help her, and then by the time the rescue squad got her, I didn't see them anymore." In addition to the gut-wrenching stories of lost lives are the tales of people who have lost everything they own. On Wednesday, Hands On Nashville volunteer Jefferson Dorsey and a crew went to a trailer park in southern Antioch. During the flood, neighbors realized that an elderly man who lived there was missing, and they boated to his home. They found him sitting in his easy chair in chest-deep water, Dorsey said. He had apparently suffered a stroke before the flood and couldn't move. The neighbors saved him. "It was absolutely heartbreaking to dismantle his entire life," Dorsey said. "We saved what we could, but he has very little left. He hasn't been well enough to come home and see the destruction." Laura Mitchell, Brian Mitchell's wife, said the couple has hosted four families and numerous pets in their house since the weekend. A family friend has been delivering food for everyone. But the situation is not sustainable. "We seem to be running out of water," Laura Mitchell said. "When you turn on the water, the pipes shake. Everyone in the city has been ordered not to use water unless it's an emergency. I haven't had a shower in four days. "This is frightening for so many people," she said. "I don't know how much longer this city can do without real help."